If you save to screencast.com with snagit so that it puts the clip on your clipboard for pasting into a text message, it doesn't only show the recipient the image, but also the library in which the image is being stored. A sister product by the same company called Jing (free, but not nearly as functional), does not do this. 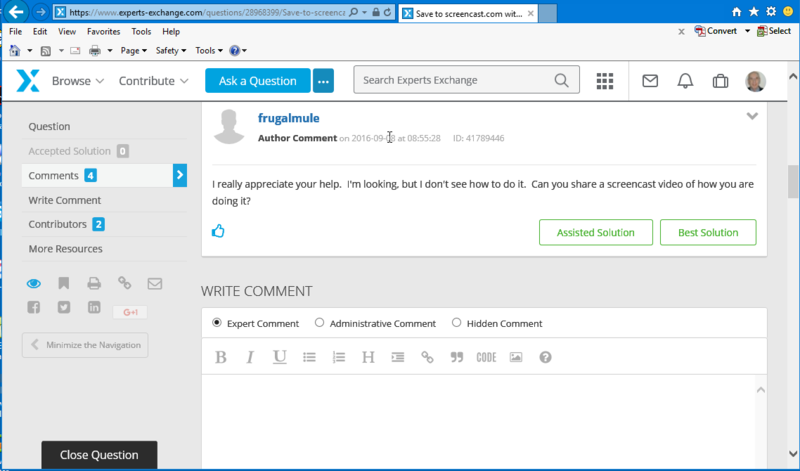 How can I use screencast.com in snagit, but prevent the library from showing to the end user? I use SnagIt myself. I save the file and then use or transmit the file outside of SnagIt. The Library never shows. I'm not sure what you are referring to. If you have to save the file locally first, it kindof defeats the purpose of having an easy to share method like screencast.com. How can I continue to use screencast.com without showing my whole library? Can you "screencast" a local file of any kind? That is what I was referring to. Also in the lower left corner of SnagIt, you can close the Library. Try that. I really appreciate your help. I'm looking, but I don't see how to do it. Can you share a screencast video of how you are doing it? The only place I see Library is down at the bottom of the Editor window (outside the screen being edited) and I probably misspoke above. You cannot make the Library icon disappear even after turning all the Library defaults OFF. However, In the Editor Window in SnagIt, below the screen shot being edited, there is Setting marked Recent. Click on Recent to Hide it and the Library goes away. Try that. I cannot seem to make a screen shot of the SnagIt Editor. Ok, so if you send a link to an image that you have stored in Screencast.com, what would that look like? OK, so I made a Screencast.com account at TechSmith and uploaded the image above from my local drive. Here is what I see. If I click it, it should show me in screencast.com without showing the library. Clicking that shows it to me in EE only. I do not use Screencast.com. If you want me to try something, tell me and I will see if I can try it. Everything I looked at in there does not show libraries. 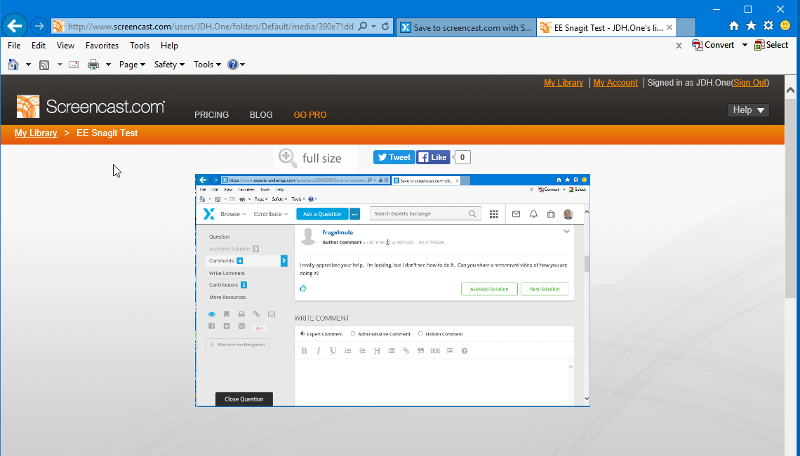 Maybe post screenshot of Screencast.com with what you see. If you go to the Techsmith Snagit editor product and click share > screencast.com > put url on clipboard, then past the link into this message, you will be sending me to your whole library. If you do this procedure similarly in the Techsmith Jing product, you will see that the link provided only takes you to the image, and not the whole library. Go to Share, Screencast.com, and select Option (below the URL list). Default folder is My Library and you can click on the folder button and change Privacy options. Change the Privacy options and/or change the folder to a completely different folder and put your images there. I don't think so. Try sharing a link and I'll bet you, I can see your library. I have done this and it shows a meaningless Test Folder as library. I do not think you can prevent this. I have everything hidden and turned off. Same, so the more items you put in there, the more a person can see. It's troubling. Jing doesn't seem to have this problem. Just limit what you put in there. I do not care if people see my screen shot. So create folders that are restricted and use those. Yeah, agreed. I think that may be the only option.